The USC football team has no time to dwell on the sour taste of their Stanford loss ahead of Saturday’s highly-anticipated matchup against the Texas Longhorns. A clash between these blueblood programs will forever captivate the college football landscape and spark infinite replays of Vince Young waltzing into the end zone during the 2006 Rose Bowl. Last year was their first meeting since that iconic day and it matched the colossal hype, with USC prevailing 27-24 in a double-overtime thriller. What fireworks do USC and Texas have awaiting as an encore? The spotlight will be fixated on the battle in the trenches as both teams endeavor to keep their young quarterbacks upright. PFF’s feature on USC is brought to you by Eckrich, the Official Smoked Sausage and Deli Meat of the USC Trojans. 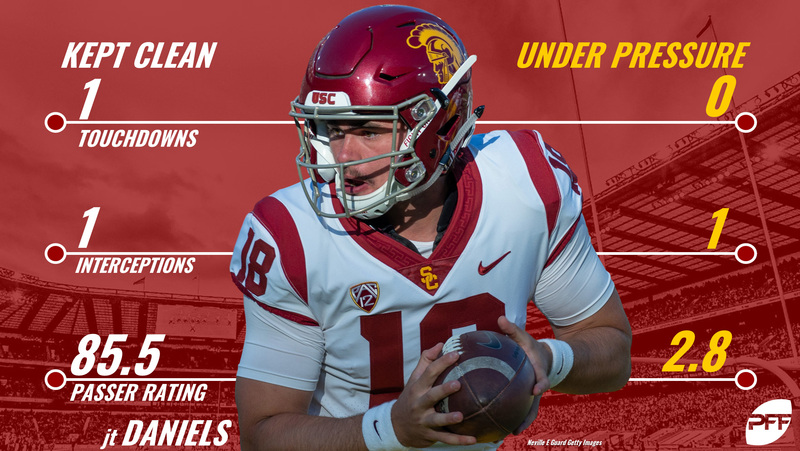 JT Daniels was knocked around against Stanford, where he was pressured on 30.8 percent of dropbacks, doubling his 15.4 percent pressure rate from Week 1. Daniels imploded when under duress by the Cardinal as he failed to complete a pass, took four sacks and tossed one interception, all for a dreadful 0.0 passer rating. When kept clean this season, Daniels’ passer rating jumps an eye-popping 82.7 points from 2.8 to 85.5 and his yards per attempt more than doubles from 3.3 to 7.9. Keeping Daniels clean and upright will be of the utmost importance to the Trojans on Saturday. Chuma Edoga (81.6 pass-blocking grade) anchors the USC right tackle position and has yet to allow his quarterback to get knocked down this season, allowing just one total pressure. At the all-important left tackle position, Austin Jackson (68.9 pass-blocking grade) has been a sieve at times, allowing four total pressures for a 95.8 pass-blocking efficiency (16th among Pac-12 tackles). As a unit, the USC offensive line ranks fifth in the conference with an 89.1 pass-blocking efficiency. Daniels is on the mend from a hand injury and the USC offensive line will have their hands full with a Texas defense that pressures the quarterback on a respectable 33 percent of passing plays (tied for seventh in the Big 12). Edge rushers Breckyn Hager (six total pressures) and Charles Omenihu (four) lead the Longhorn pass-rush and the pair have accounted for half of the defense’s 20 total pressures. Look for Hager to try and take advantage of Jackson with 82 percent of his pass-rushes coming from the right side of the formation, where he has accrued five of his six total pressures. Sophomore Texas quarterback Sam Ehlinger suffers from similar pressure problems as Daniels, though the disparity may be even greater. 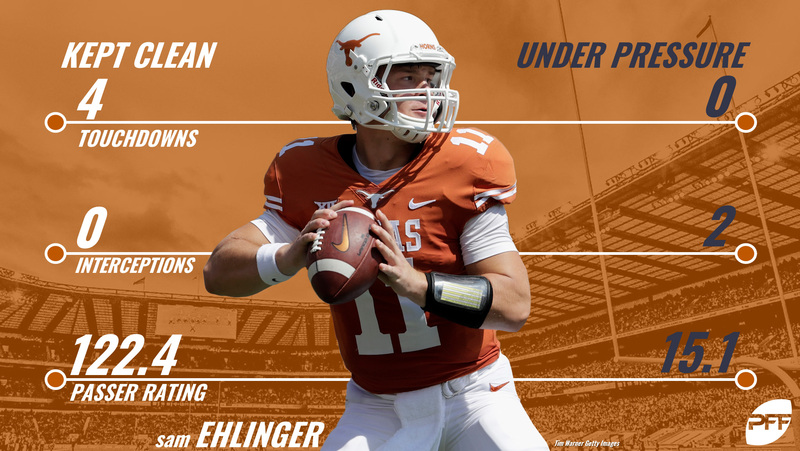 Ehlinger has been lethal when throwing from a clean pocket, tossing four touchdowns for an exemplary 122.4 passer rating (fourth among Big 12 QBs) with zero interceptions. His passer rating under pressure plummets to 15.1, a huge 107.3-point decrease. Through their first two games, the Trojans have pressured the quarterback on a sizeable 35 percent of pass plays (tied for sixth in the Pac-12). 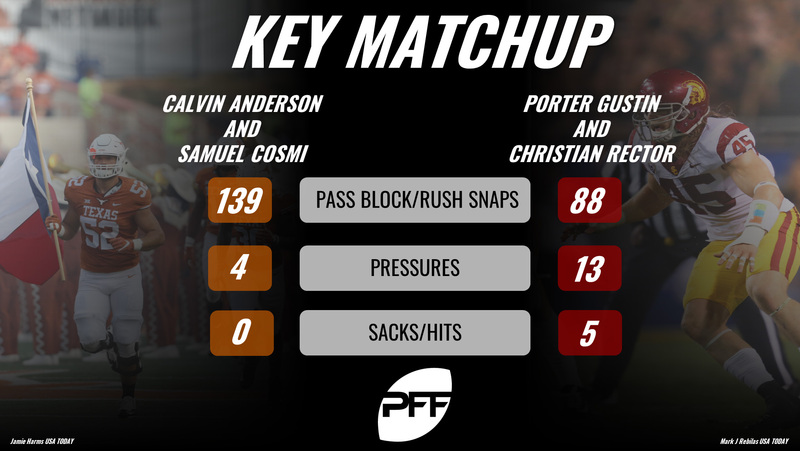 Porter Gustin (seven total pressures), Christian Rector (six total pressures) and company will look to replicate their success from last year’s affair where the USC defense recorded a whopping 31 total pressures, far and away the unit’s most of the season, with Gustin and Rector racking up two sacks apiece. Tasked with protecting Ehlinger is a Texas offensive line that has allowed 10 total pressures this season and ranks second in the Big 12 with an 89.6 pass-blocking efficiency. Left tackle Calvin Anderson, a grad-transfer from Rice, is currently the Big 12’s premier pass protector (90.4 pass-blocking grade, tops among all Big 12 tackles) and has allowed just one pressure on 72 pass-blocks. Right tackle Samuel Cosmi (80.6 overall PFF grade) has been the Longhorns’ highest-graded offensive player and is not too shabby of a pass protector himself (77.1 pass-blocking grade). The showdown between the USC edge rushers and Texas tackles will be a contest of strength on strength and likely become a war of attrition. USC and Texas have each suffered an early-season loss and both teams are desperate for the type of victory that can reshape a season’s narrative. While Daniels and Ehlinger are both fully capable of realizing the play required to win a game of such magnitude, they each have demonstrated heavy vulnerabilities to pressure. It will be imperative for them to be kept clean, lest the opposing defense come up with a timely pressure that sparks an impact play in one of the game’s decisive moments. Texas Memorial Stadium will be rocking on Saturday night and we may witness one splash play change the course of an entire season.